Have you ever dreamt of flying to the moon? Meeting an alien? Becoming an astronaut? Join star seekers Alph, Betty and Gammo on a journey through space where you take the steering wheel. Inspired by our childhood wonder of the universe, this unique theatrical experience explores the limitless majesty of galaxies, the solar system, shooting stars and planets through songs, silliness and anti-gravity antics. We need Waterloo’s Star Seekers to help us complete our mission and answer one of the greatest unanswered questions of the universe: What do astronauts really have in their packed lunch boxes?! After the success of previous family shows Eliza & The Wild Swans and Edgar & The Land Of Lost, as well as international hit productions Riot (performed in The Shed at the NT) and 33, The Wardrobe Ensemble originally created this show for young audiences in collaboration with The Wardrobe Theatre. Directed by Helena Middleton, the cast includes Jesse Meadows, Ben Vardy and Jack Drewry with Musical Director Jack Drewry. The Star Seekers will be accompanied by creative workshops and activities for families. Visit the NT space station 1 hour before every performance to take part in free family activities, or book in for a family workshop to take your space adventure out of this world. 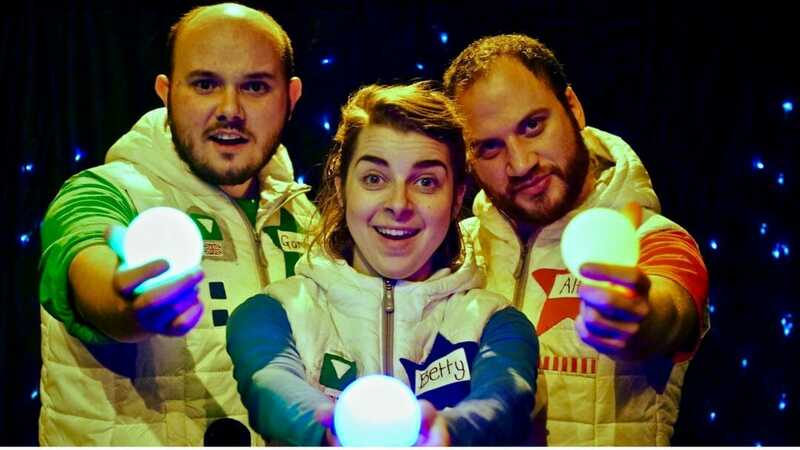 Invent intergalactic stories at a devising workshop, create space-tastic songs and made-up melodies in a music making workshop or hear from the star seeking cast in a special post-show Q&A.